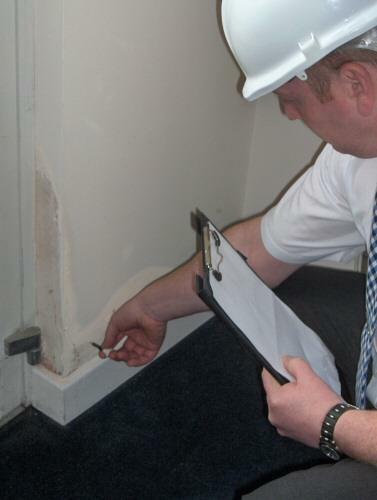 WallProtect accurately records moisture content in concealed areas/materials. It is commonly used to confirm the drying out of buildings and materials saving insurance companies time after a flood/leak. Can be used on solid floors. We have set wall protect at 75%RH , if after 24 hours following installation it has not reacted the wall/material is dry and redecoration can take place. It can also be combined with DampProtect, both easy to read and install. 1. Drill a hole of at least 50mm (2 inches) depth and a diameter of 8mm. 2. Clear the hole of drilling residue. 3. Remove WallProtect from packaging. Safely discard silica gel. 4. Place WallProtect into hole until end plastic is flush with outer surface. Avoid contact of Sensor end with material. 5. Allow for 24 hours of undisturbed measuring time. 6. Extract Wall Protect. A blue colouring is evidence that the humidity in the material structure has exceeded the threshold value. Flood/restoration contractors able to prove moisture levels in floors and walls locating damage. Monitoring potential water ingress behind dry lining within wall cavities. Tools for Quality Assurance in construction projects including recently laid concrete floors. WallProtect can be used throughout the construction process to prove that critical levels of moisture have not been exceeded. WallProtect accurately records moisture content in concealed areas/materials. It is commonly used to confirm the drying out of buildings and materials saving time after a flood/leak. Can be used on solid floors.